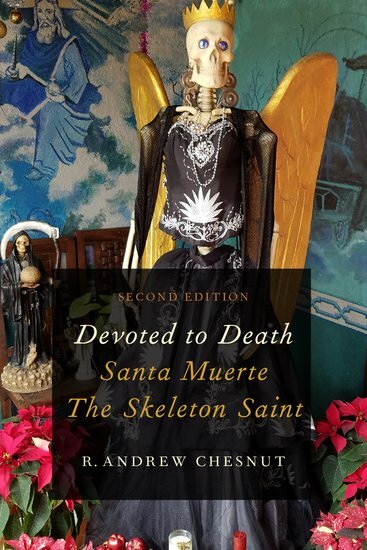 The following piece was submitted by Gabriel Oakfield, a Neo-Pagan Santa Muerte devotee from the United Kingdom, who provides his personal perspective on Santa Muerte’s place in bridging tensions between a Catholic upbringing and his sexual identity. In this reflection Oakfield also allows us to see one way in which Saint Death’s decentralized global presence is acting as a catalyst for those uncomfortable with categories such as ‘religion’ to find a new path for expressing their spiritual identities. The Church, like God, should be a universal Mother, but she is not. She accepts her children only on her terms and some of her children are subject to her judgement, repression and censure. Some she has openly condemned and persecuted, if not currently, then historically – and a shadow, a question, lies over not only their acceptance but even redemption on account of their very nature, which is labelled sin. As a gay man, raised as a Catholic (and also adopted) I know a little about the feeling of rejection. Through a long and difficult journey to accept myself, in my wholeness, I have come to see the condemnation of homosexuality, whether it be from Church or God Himself, as a condemnation and rejection of my intrinsic being, body and soul. For those of us who long for acceptance, it is necessary to turn from the one that rejected us and seek that acceptance elsewhere. In some ways, I suppose, I’ve always been looking for my mother. Early in my spiritual forays beyond the Catholic fold I came to the Goddess, as worshipped by Neo-Pagans – and I still relate to the Divine primarily in feminine guise. The Goddess, the Great Mother, was a necessary antidote to the harshly judgemental Father as misrepresented by the religion of my childhood. But despite my Pagan self, a part of me always remained Catholic. As much as I chafed at my adoptive mother calling me a ‘lapsed Catholic’ – there was some truth in that. I could never entirely disentangle myself from that early and sustained socio-religious enculturation, nor from the colour, the iconography, the rich symbology and the ritual. But how could I embrace the Catholic part of my identity and not reject my intrinsic, sexual identity? Where and in whom, within the Church, could I find acceptance and wholeness? Well, I haven’t entirely returned to the fold. But in Santa Muerte, I have found an all-embracing, loving and truly universal Mother who also exists within and alongside Catholicism, albeit in a similarly uneasy relationship with Church authority. They condemn her too, of course, and in similar terms, as a ‘perversion’. But I have been able to re-embrace elements of my Catholic tradition because of Santa Muerte, even if the Church cannot or will not embrace her, anymore than it will wholly embrace me, as a gay man. It is ironic, perhaps, and it doesn’t speak kindly of over two millennia of Judeo-Christian monotheism that Death Herself should come to be recognised as a more inclusive, all-embracing, non-judgemental and fiercely defensive figure than God, or even than what Christ has become to so many. Death does not discriminate. And if you’ve suffered discrimination, you’ll know how much that means. But the figure of Death has another appeal: because death is really at the heart of every religion as a motivating factor. So many of us use religion as a means to allay fear and anxiety about our mortality. We choose to believe in a God that will grant Eternal Life beyond death, or in reincarnation or bodily resurrection or in any number of other theological palliatives. Of course, with Santa Muerte, you have to face death. She is Death. But she is also a Comforter. Going straight to Death Herself you cut out the pretences and go honestly right to the heart of the matter, right to the heart of religion – to Death both as a comforter and a transformer. And Santa Muerte, the Powerful Lady, is one Saint who will get to work, not only transforming us (though never into something against our nature) but also in transforming the conditions of our lives, love, finances. She is not difficult to believe in. In ordinary life Death is the one divinely appointed power that we all have direct, impactful experience with. We all grapple with mortality. All of us are subject to her power. All are equal before her; woman, man; young, old; rich and poor; gay, straight; black and white; human, non-human. Death is inclusive. There’s nothing, or no-one, more inclusive than Death. Unlike religion, that can be divisive and judgemental, Death, rainbow arrayed, welcomes all and turns none away. In terms of available religion, it is Santa Muerte who stands unequivocally and unmistakably for inclusion and acceptance, and not God, not Christ, who, co-opted by literalists, traditionalists and fundamentalists have so often been made into ogres of condemnation and judgement. It is not just our culpability and our evils, but so much that is good – life, sexuality, our bodily existence, our very natures, our wholeness – that they are made to condemn. It may seem strange to those who do not know Her, but Death is life-affirming. It is Death that supports and upholds life, in all its diversity. She sustains all life. Everything that dies sustains the living. All the living, not only the righteous and the chosen, live because of what Death has given. She teaches us that all beings are the same before Her, because all beings shall come to Her, in time. Her hour glass is a reminder that every mortal moment is precious. Her message is to live, to live life in all its fullness, to live now, because now will never come again. In choosing Death, paradoxically, I have chosen life, life now, life undivided, life lived in wholeness, life in a rainbow of colours. Can I have someone to worship that doesn’t judge me being gay or white or fat or bald or anything.